Shaman – a dangerous friend! I finished this painting just as I was making another shift on my personal shamanic path as well as work, further exploring the role of the contemporary shaman. 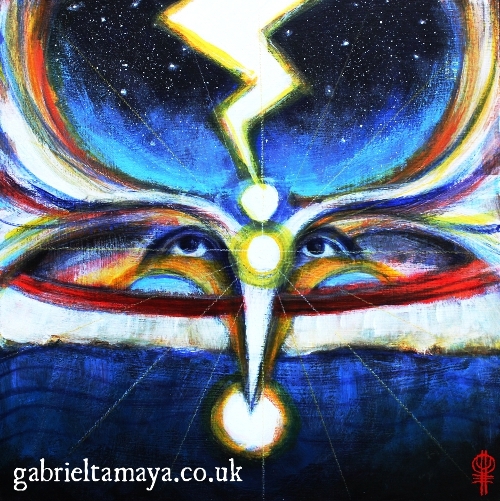 This painting talks about the wholeness of the shamanic path, that it is a path with edge, and a sharp one at that! It is a juicy, living, bloody and muddy path that honours the dark as well as the light within us all. The one that recognises that we are whole luminous beings, that we do not need to ‘get rid’ of anything, only transmute and transform the misconceptions that we hold about ourselves that hold us back and keep us small. This is the shaman as ‘catfish‘, the dangerous friend who will do what needs to be done, tell you what you truly need to hear or won’t see, but tempered with compassion. The shaman is the one who mixes it all up when you have scared yourself into stagnation, who sees past the wounded stories you tell about yourself, the one who throws the proverbial tiger amongst the pigeons when you need it most! The shaman is also ‘anam cara‘, a soul friend, one who sees the potential and brilliance within us all, who holds a vision of us as we truly are behind all the fear, wounds, procrastination and playing small – that we are Spirit. They have walked this path, they carry medicine borne from their experiences of transmuting their wounds into their power, and their journey beyond this. 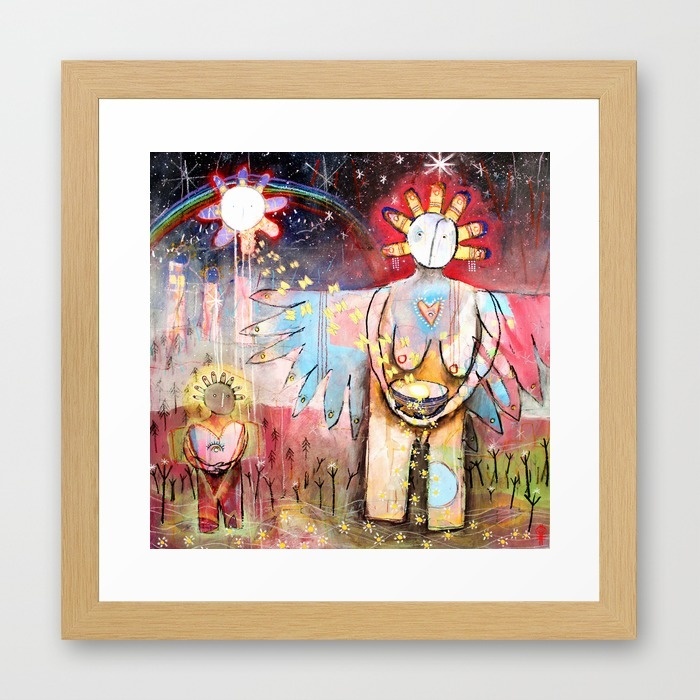 This painting depicts the shaman – piercing the three worlds, head bowed in humility, seeing from a place of heart, struck with inspiration from Spirit whilst sourcing deep from the waters of life, guided and watched over by the ancestors. We all have a part of us that holds the energy and role of the shaman, one that we can access for council and assistance on our path in life, all we have to do is hold space and invite them forward.